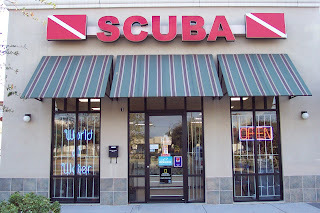 Hanging out at the dive shop. Last weekend, we were driving along the Southern State Parkway on Long Island when old memories suddenly came back to me. As we approached the Baldwin exit 20S, I remembered hanging out with my dad at the dive shop on Grand Avenue. My dad was really into scuba diving for most of my life. 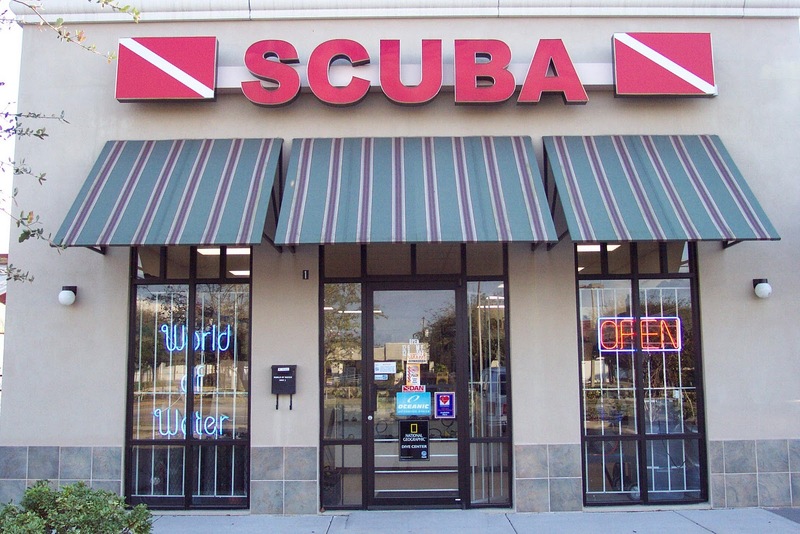 Around 1982, my dad would take me to his friend's scuba diving shop every Saturday morning. Dad was tight with the owner -- a jolly, Irish white-haired man everyone loved. He would let me have anything I wanted. The shop sold Lance brand snacks. I remember munching on endless packages of peanut butter sandwich crackers and playing hours of free arcade games while dad would sip coffee and talk shop with his dive buddies. A big fan of E.T., I created a poster of E.T. wearing a scuba mask and tank which the dive shop owner loved. He hung my poster up and left it there for as long as I can remember. Those were good times -- innocent, happy times spent hanging with my dad while mom was busy cleaning and food shopping. It's funny how free arcade games and snacks were all it took to keep a kid content back then. Twelve is the best age. If I could close my eyes and be 12 again, all would be right with the world--my parents would still be together, my bills would be nonexistent and I would be a much smaller shoe and clothing size. Oh well... We all know age is inevitable. 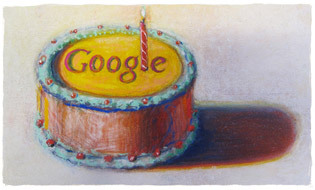 I wanted to use today's blog post to honor Google. I always remember Google as the internet search engine company many of my former coworkers jumped ship to work for. Between 1999-2001, I was working at a teen internet company called Snowball.com which owned the male gaming website IGN.com, a girl power website called ChickClick.com (I loved ChickClick!) and some other sites like HighSchoolAlumni.com. Business wasn't going very well by 2001. Our stock options dropped to about 40 cents a share and there were rounds of layoffs every quarter. It was so depressing. I loved that job. 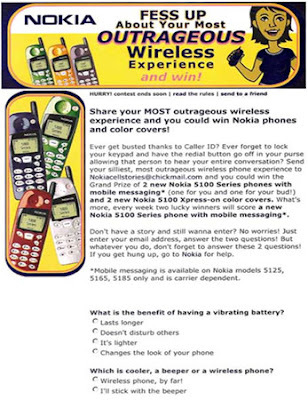 It was my first copy writing job and I had the chance to work on awesome interactive ad campaigns. I remember each time I made the layoff cut, I felt as if I had won some sort of job lottery. As the dot bomb blew up, my coworkers began leaving in droves for a place called Google. The name made me giggle and I wasn't really sure what it was they did exactly. I remember receiving a call from a former coworker a few weeks after she and about ten others left for Google. She asked if I would mind helping her with a writing project. One of my biggest career regrets is turning her down. I told her I wasn't good enough to write something targeted to adults. At that time, I had only written for kids. She urged me to give it a shot, I refused. Yet another awesome opportunity turned down by low self-esteem. Today, our VP who left for Google is now the CEO of AOL, another internet company I worked for and fell victim to rounds of layoffs. Anyway, that's my Google story. Happy birthday Google! We'd be lost without you--literally, I love Google Maps. 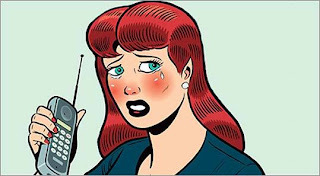 My Verizon DROID phone is just as dependent on you as I am. Thank you for Blogger and Google Analytics and much, much more! Happy Belated Birthday Super Mario Brothers! I know I'm late to the party -- September 13 marked the 25th year of Super Mario Brothers, but I still wanted to take time to post about the Nintendo video game's special birthday/anniversary. I have memories of my brother and I playing hours and hours of Mario Brothers in my parents' upstairs TV room. It was the only Nintendo game I really loved, next to Tetris of course. I was raised on Atari and for some reason by the time Nintendo came out, I was a bit over the whole video game craze. Today, my husband plays hours of Mario Kart for Wii and these days the Mario games are much more challenging than the original Mario Brothers games. Last Christmas, I bought him New Super Mario Brothers for Wii and hoped we would be able to play together. I couldn't get into it. Today's games are much more difficult and technical -- I just can't keep up. I feel so old. Mario wasn't always a plumber, he was originally a carpenter. Since 1995, the voice of Mario has been provided by American voice actor Charles Martinet. He also voices Wario and Luigi. The first Super Mario Bros game has sold 40.24 million copies. Back in the early 1980s, we had awesome TV shows for kids featuring wacky looking singing and dancing puppets. If you think about it, I'm sure you can name a few. One show I really enjoyed was The Great Space Coaster. 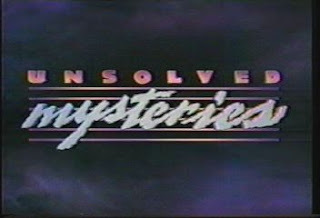 This 30-minute show lasted for five seasons and starred characters such as Goriddle Gorilla and Edison the Elephant. And of course, Who could forget Gary Gnu's "No gnus is good gnus show"? To this day, 30 years later, I can still sing every word of the theme song... "It's The Great Space Coaster, Get on board. On The Great Space Coaster, We'll explore. A comet ride of fantasy..."
RetroJunk.com describes The Great Space Coaster as, "A kid's fantasy/variety show about three friends who leave Earth each day in their 'Space Coaster'. Each episode featured several musical numbers (usually dealing with the various issues and problems kids face every day), plus news reports from Gary Gnu and book reviews from Speed Reader." Relive the memories with The Great Space Coaster theme song! My personal favorite, Gary Gnu! Growing up in the late 1980s, I went through a strange, short-lived hippie phase thanks to my love of The Monkees. Two items I adored, were my mood ring and my mood lipstick. Both of these accessories were said to change color based upon my emotional state. I'm not sure if they really worked, my mood changed but my lips and ring basically remained the same color. What Is A Mood Ring? The mood ring was invented by jewelery designer, Marvin Wernick in 1975. He is said to have come up with the idea based upon thermotropic strips of material which are applied to the forehead to gauge someone's temperature. The mood ring contains a thermochromic element in the form of liquid crystal which changes color based upon the temperature of the person wearing the ring. Temperature linked to emotional state would equal the mood of the person wearing the ring. 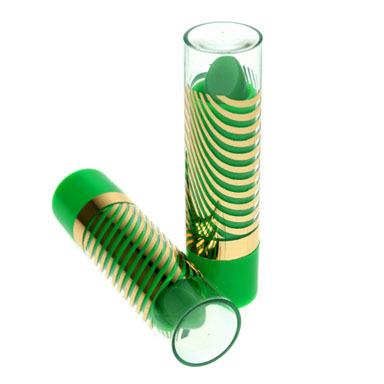 Like mood rings, mood lipsticks were to change color depending on your emotional state. Personally, I doubt this actually worked. It felt as if my lips were always pink although the lipstick looked green in the tube. Did you own either of these mood accessories? Do you think they worked? Pop art has always been very hip with young people. Kids from the 1960s had Andy Warhol. Children of the 1970s had Peter Max (I had a Peter Max bed sheet set and loved it!) and we 1980s kids had Keith Haring. Danny, my BFF in 7th grade (1985), first introduced me to cool Keith Haring designs. He had several Keith Haring Swatch watches, which we thought were totally awesome. I remember posters, t-shirts, stickers and other collectibles could be purchased at Pop Shop on NYC's Lafayette Street in SoHo. The stuff wasn't cheap of course, but it was so rad, you had to have something Keith Haring if you were truly hip and new wave. Keith Haring was born in Reading, Pennsylvania and grew up in Kutztown, Pennsylvania. He studied graphic design at The Ivy School of Professional Art in Pittsburgh between 1976-78. Keith Haring moved to NYC at age 19 and studied at SVA, School of Visual Arts. Keith Haring died on February 16, 1990 of AIDS-related complications. All ticket proceeds of Madonna's first New York date of her Blond Ambition World Tour went towards AIDS charities including AIDS Project Los Angeles and amfAR. 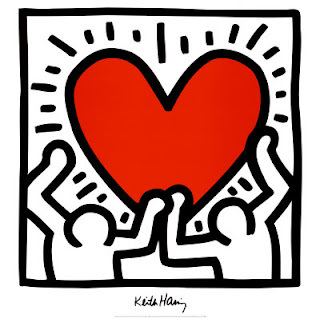 Keith Haring's work was included in the song "Into the Groove" during Madonna's live performances on her 2008 tour and during the U2 performance on the 1997/1998 PopMart Tour. Didn't You Wish You Could Be A Dance Party USA Dancer Back in 1987? The original guidos could be found on Dance Party USA! Dance Party USA was shot live-to-tape (like most TV talk shows) in Philadelphia, PA and aired from April 12, 1986 to June 27, 1992 and was originally 30 minutes long, but was expanded to an hour in 1987. The show was also a vehicle to introduce little known singers and bands to a national audience. Researching on YouTube, I couldn't find any singers who really became all that famous. I do remember that the most famous regular on the show to date is Philly native, Kelly Ripa. She was one of the dancers. Prepare to laugh yourself silly with this 80s awesomeness. More Dance Party USA fun! Sipping my iced tea through a boring clear straw, I had a thought. What the heck ever happened to Crazy Straws? As a child, I thought I was such a big shot, sipping my chocolate milk or lemonade with a Crazy Straw. I loved watching colored beverages pass through the thick, twisted plastic straw right before my very eyes. Back in the '70s, I don't remember Crazy Straws being super sophisticated or coming in different shapes and sizes. 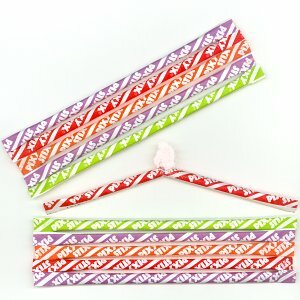 I believe they were just twisted and fun and everyone at school had to have one. 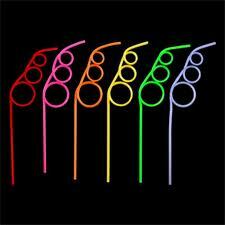 Today Crazy Straws are available in a wide variety of shapes and themes and aren't just for kids! Check out their website for straws for Bachelorette (they keep it clean!) parties, poker and more. Did you have a Crazy Straw? Do your kids use them today? Viewing the commercial as an adult, I can see how some would find the gum and the ads slightly perverted. It makes me miss the feeling of innocence sometimes. Much like when I watch an old episode of Three's Company. I had no idea Jack was supposed to be gay to live with Chrissy and Janet. Who even knew what gay meant at age 8 back in 1980? 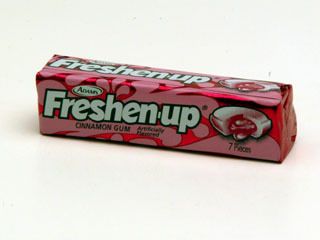 Freshen-up gum is manufactured by Cadbury Adams in Brazil and is said to be exported to the North American Market. It was introduced in 1975. I'm surprised it's still available today. I had no idea. I'm going to keep an eye out for it. Amazon sells it here. 9/11/2001 was nine years ago today, I was living on 29th and 8th in Manhattan. It had always been a dream of mine to live in the city before I turned 30. I was 27 back then. I remember sitting at my desk in the old 18th Street & 6th Avenue offices of America Online. It was before 9am and I received an IM from my buddy Chris who worked for a big financial firm, it may have been Lehman Brothers or Goldman Sachs, I forget. His message said something about a plane hitting the World Trade Center. I thought it was so odd, why would the pilot be flying so low? What a horrible accident. I felt bad for everyone involved. At that time, I had no idea the accident was to become one of America's most devastating tragedies. A few minutes later, he sent another IM saying the other tower was hit. This obviously was not an accident. Everyone in the office began buzzing about it. People were shocked and confused. Within about twenty minutes, the office became eerily quiet as security descended upon our desks. They escorted us down several flights of stairs. We were not to use the elevator. We stood outside the AOL building staring up at the smokey sky only a few miles away from where we were. Shock and horror are the only words I can think of to describe our faces. It was sheer chaos. Like a horror movie, only it wasn't a movie, it was real and it was going on around us. I proceeded to walk home slowly. It was such a beautiful sunny day. Much like it is today. I remember cars pulled over to the side with their car stereos blaring the news. 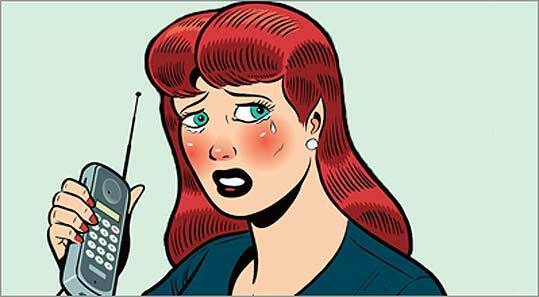 I remember people desperately trying to make calls on their cell phones, me included. I remember lines of people standing near pay phones. I remember mascara running down tearful faces of impeccably dressed girls leaving their offices in confusion. I remember arriving home to my tiny studio apartment and finding a man tiling the lobby as if it were any other day. I remember my best friend, Scott somehow getting in touch with me. He couldn't get home to Queens, so we met up and went for a burger at a local McDonald's on 8th and 27th. I remember after a few minutes, the owner of that McDonald's asking everyone to leave. He was closing up for the day even though it was early afternoon. 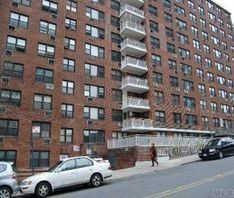 I remember friends who couldn't get home, sitting on my bed-- there wasn't much seating in my 20x20 apartment. We huddled around the TV. They drank Heineken and sucked on Marlboro Lights and talked. I remember not having to work that week. I remember wanting to get home to my mom's house on Long Island. I remember Penn Station on September 12, filled with armed National Guardsmen. I remember feeling safe upon arriving to my mom's house. I remember watching horrifying news story after news story. I remember hearing about firemen and policemen killed. I remember hearing about Long Islanders who thought they were simply going to work that day never coming home again. I remember the tears and the heartache I felt for everyone who lost someone. I felt guilty to be alive in a strange way. A part of me died that day and I will never forget. 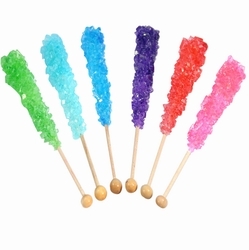 Rock Candy also called Rock Sugar is typically available at small specialty candy shops or gourmet stores. As a child, I'd always grab one when we took vacations. I'd usually find Rock Candy in souvenir shops. Rock Candy is made by boiling sugar in water and allowing it to stand for a week. In researching, I'm surprised to learn that this candy is big in foreign countries and even used in teas in Germany and as a breath freshener after meals in India. Pixie Stix or Pixy Stix are paper straws filled with flavored (grape, cherry, orange) sugar and are sure to put you in the dentist's chair! Sunline began making Pixy Stix in 1952 in St. Louis, Missouri. In the late 1930s, the sugar was actually marketed as a drink mix. When the makers discovered children eating the sugar right from the drinking straw, they switched their focus from drink mix to candy. This led to my next favorite candy, Fun Dip. Fun Dip was originally called Lik-M-Aid, Wonka produces Fun Dip. Fun Dip was three small pouches of flavored sugar (similar to that of the sugar in Pixy Stix or Pixie Stix). Fun Dip came with one or two edible marshmallow flavored sticks. You would lick the stick, dip it into the Fun Dip and the sugar would stick to the stick. Once you were all done licking up the flavored sugar, you were able to eat the sticks. Yum! What's your favorite old-school candy? Recently, our landlord repaved our parking lot. Yesterday, while walking along the newly paved blacktop, I remembered something I hadn't thought of in 25 years... "This pavement is perfect for roller skating!" As a little girl, I loved to roller skate. Everyone in the '80s roller skated. It was just the thing to do. 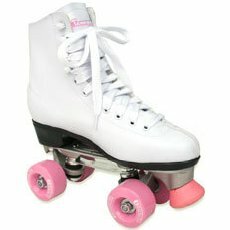 I had white skates with pink wheels and stoppers, much like the skates above. Running paths, school yards or parking lots with new pavement were always my favorite to roller skate on. That smooth surface made it easy to maintain my balance. It's funny what was important to me at age 12. Mom ironing my uniform, while I organized my notebooks and wrote my name on each cover. "Today Dawn was over. We ate at Friendly's for lunch. Today is the last day of vacation. I got a hair cut." Applying DEPECHE MODE and THE SMITHS stickers to my blue binder and selecting three or four new wave outfits for the first week of school. Throughout my college career, I transferred four times -- so the memories vary. For example, Freshman year, I recall Mom and I shopping Bed Bath & Beyond for a extra long sheets, a mini fridge and a hand-held shower caddy to hold my shampoos and soaps. Most adults view January 1 as the beginning of a new year. Everyone makes their resolutions and thinks of New Year's Day as their fresh start. For me, it has always been September. There's something about the school fiscal year that fills me with a sense of newness. A glimmer of hope and excitement take over me. I imagine something amazing is in store. New friends, new pathways, new doors opening ... I blame this on the old school days. Does anyone else feel this way?